Description: From 3 to 10 inches tall. Leaves are divided into 3 toothed segments. 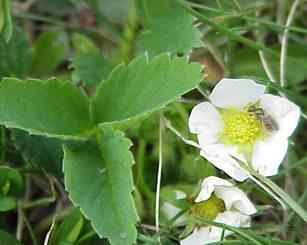 Fruits are a smaller and much tastier edition of the garden strawberry, Wild strawberries usually have a sharper flavor than the garden strawberry. 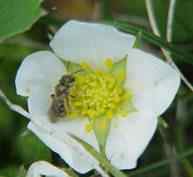 The indian strawberry, Duchesnea indica, is similar but with yellow flowers and tasteless fruits. Location: Fields, wood borders, roadsides.